Reef compatible, though may eat other fish. Can play host to a variety of Clownfish including Amphiprion clarkii, Amphiprion chrysopterus or Amphiprion polymnus. This anemone will actively eat fish if they're available by forming a ball around them so they are unable to escape. In captivity it should be fed large meals of Artemia and other plankton-like foods. 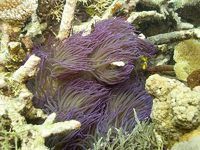 It also receives some of its nutritional requirements from the symbiotic algae zooxanthellae. Native to Indo-Pacific. It requires strong lighting, porous live rock, and a variety of sandy and rocky locations from which it can choose to live. Comes in several colour forms and has long slender tentacles. Most commonly is light brown to tan in colour, but pink, purple and yellow colours are also available. Many dyed Sebae Anemones are seen in the pet trade, often white with coloured tips. Do not purchase these anemones!! They have a very poor lifespan in captivity, around 6-8 months if you're lucky, and when they die they will kill a lot of other tank inhabitants. The white colour means they've lost their zooxanthellae and not even experienced marine public aquariums can keep these white Sebaes alive. Beware, they are often sold to beginners!